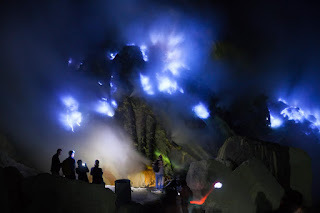 Blue Flame Ijen Crater, Sukamade, Mount Bromo tour 4 Days is one of the nature tourism package begin Surabaya, Malang or Banyuwangi with private tour package. The nearest way enjoy Blue Flame Ijen Crater, Sukamade and Mount Bromo tour package 4 days is from Banyuwangi. If You start your trip from Surabaya, You must start in the morning around 07.00 - 09.00 AM. For visitors who have the flight arrival in Surabaya Airport at afternoon and finish at Banyuwangi Ketapang Harbor, You can choose Mount Bromo, Ijen Crater tour package then Sukamade Beach tour. Our driver will pick you up in your arrival at Banyuwangi Ketapang Ferry Harbor using private AC (air conditioned) Car, Then take you to your hotel around Banyuwangi or Ijen Crater area for 2 hours driving, check in to your hotel and stay all nights. Comeback to Paltuding (Ijen parking area) for 2 hours through same route and comeback to hotel to have lunch, take shower and relax enoughly. 08.00 PM, Visit the Sukamade beach for 1 hour with the rangers (hope You bring flashlight, trekking shoes or slippers, pole). Reach the Sukamade, You will see directly the process of turtle laying eggs at wild habitat until finish at 00.00 midnight. 08.30 AM, Finish enjoy Sukamade tour, Take you to Banyuwangi regency for 6 hours and accompany to your Hotel around Mount Bromo for 6 hours, Reach the Hotel in Mt Bromo area, Stay 1 night. 02.30 AM. Wake You up for preparing, take shower and visit Pananjakan (highest peak in Mt Bromo) for 30 minutes using private Jeep, Reach the Jeep parking, do trekking for 10 minutes toward the View Point then waiting Mount Bromo Sunrise appearance. If You want to see Mount Bromo Stargazing, You can start from your Hotel at 09.00 PM. 12.00 PM. Check out from Hotel and comeback to your location request (Surabaya Airport, Malang, Yogjakarta or Bali Island), After you reach your location, finish 4 days 3 night Blue Flame Ijen Crater, Sukamade, Mount Bromo tour package. Before You choose Blue Flame Ijen Crater, Sukamade, Mount Bromo tour package, You can prepare complete clothes like Jacket, Gloves, Hat, Trekking Pole, Trekking Shoes and Long Pants because the temperature on Blue Flame Ijen Crater and Mount Bromo peak around 03 - 05 degree centigrade. Detail information about Mount Bromo tour package price and facility, You can visit Our Contact.